Dead Man’s Hand – Mark Loves History! Today in History, August 2: 1876 – Deadwood, South Dakota. Gunfighter, sometimes lawman, showman, gambler, vagrant Wild Bill Hickok is sitting with his back to the door in a saloon playing poker, holding a pair of black aces and black eights. A coward steps behind him and shoots him in the back of the head, killing him instantly, Hickok’s pistol still in it’s holster. 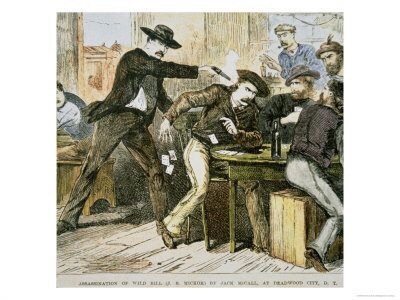 The coward attempted to shoot others in the saloon, but the first round was the only one that wasn’t a dud. He would be tried and hanged. Hickok’s last hand is now known as the “Deadman’s Hand”.